Healthy living encompasses not only the physical body, but the mind as well. Mental health plays just as important role in one’s overall health and happiness, and needs to be treated just the same. Below is a recent submission to a magazine I wrote about my own battles with mental health. This post will be one of many I will write in regards to mental health, but I thought it was important to share my story first. “My anxiety started when I was in elementary school. I almost never raised my hand in class to answer or ask questions because I was so anxious and fearful that I would be wrong or seem stupid. I remember sitting in class all the way through high school wishing, hoping, praying that the teacher would not call on me. It took me a while to make friends because I was overly anxious about fitting in, a symptom of anxiety. While my mother says that I was shy, after much research I know it was anxiety and not shyness that held me back. I say that because I doubt most people today would think I’m shy. They know me as opinionated, honest, and forthcoming. My anxiety escalated in middle school when I would wake up in the middle of the night in a panic, feeling as though the walls of my bedroom were closing in around me. My body felt tiny, yet my hands huge. I realize now I was hallucinating to some degree. There was a definite disconnect from reality, which is a symptom of a panic attack. I would have to wake myself up by turning on the light and reading for a while. Eventually the feeling subsided, and I would be able to fall back asleep, but it drained me, and I would be exhausted the next day. In high school, my anxiety sky rocketed even further. It began hampering my sports and academic performance. The morning of a test I would feel nauseated, my mind racing with test information, yet I couldn’t seem to put it together, and I was so sure I was going to fail. I was a good student, though, and somehow managed to get good grades despite my constant worry over poor performance. Teachers always described me as a conscientious student, but I needed constant reassurance. Kids with anxiety disorder generally need constant reassurance and seek perfection. I was the same when it came to sports. I strived to be the best and sought the attention of my coaches. On race days (I was a cross country runner and alpine ski racer), I would experience a whole gamut of anxiety symptoms that by the time the actual race began, I was nearly drained of all my energy. Sometimes I wonder how much of a better athlete I might have been had it not been for my anxiety disorder. By the time I got to college, I was still experiencing these feelings of anxiety, yet I did not have a name for it. Honestly, I just thought I was crazy. I continued to strive for approval. It wasn’t until I was sitting in Psych 101 class when the professor wrote “Generalized Anxiety Disorder” on the board and began listing the symptoms that I thought, “That’s it! That is what I have!” I can’t tell you how enlightening it was to figure it out. I was not crazy. There was actually something medically wrong with me, and I could get help for it. I began talking with the college guidance counselors and then an outside psychologist to begin confronting this disorder. Despite a diagnosis and therapy, and occasionally medication (It took me until recently to find one that worked for me), I continued letting the anxiety take charge. There were times in my life I was medication free, but when a major change took place, the anxiety became too difficult to handle with just my cognitive behavioral tools. I graduated with a Master’s of Education in athletic training and passed the Board of Certification exam, yet working in the field caused me great distress. I was in constant fear of causing harm to the student athletes, or of incorrectly assessing their injuries and being sued. I needed constant reassurance and approval from the head athletic trainers with whom I worked. I would obsess on possible worst case scenarios instead of focusing on the issue at hand. Planning my wedding heightened my anxiety to such a degree that I nearly called it off two months before the date. And when my daughter was six months old, the anxiety and panic I was experiencing was so bad I was forced to stop nursing, sought the guidance of a cognitive behavioral therapist in the area, and finally found medication that worked to subdue my major anxiety. I figured that in order to be a good mother it was important that I was composed and even-keeled, rather than anxious and unbalanced. Between cognitive behavior therapy and medication I have combatted this mental illness to lead a fuller life. While I still experience anxiety and low grade depression on some occasions, sometimes completely out of the blue, I now use behavioral tools, such as yoga and other forms of exercise, muscle relaxation techniques, and deep breathing exercises, to deal with them. The medication seems to make a huge difference, too. I do not shy or back away from things. I face them head on (most of the time) and know that once I push through them, life will be better. Even though my anxiety challenges me, it boosts my confidence when I succeed. I am confident I can prevail over the anxiety. When I began noticing that both my children experienced signs of anxiety, I did not want them to be judged by it or feel they needed to hide it. I decided it was time to “out” myself publicly and get the word out there about mental illness. So despite the anxiety, I stood up in front about 600 high school students and faculty (We live and work at a boarding school.) 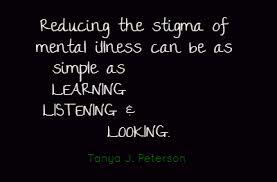 and urged everyone to stand up against the stigma of mental illness. Mental illness is not something you choose. You choose to do something about it. You either get help, don’t get help, or don’t get proper help and turn to other vices to deal with it, which could become another issue. Mental health issues are vague under the whole medical health category, but it is important that we begin seeing mental health as part of our whole being. We need to support both mind and body, and not separate the two. The brain is part of the whole body; therefore we should not be separating mental health from physical health. Mental illnesses are medical conditions and should be treated medically, not brushed under the rug. We need to work on the language through which to articulate mental health issues so both mental and physical health are respected under the same umbrella of overall medical health. We need to encourage those with mental illness to seek the courage to speak about their illness and seek proper treatment. I am currently medication free and am feeling great despite chronic pain in my neck. I attribute my current state of mental health to the fact I have been exercising on a regular basis. It definitely helps keep both anxiety and depression at bay. Now, if I could find medication to just treat my osteoarthritis! Wondering how you deal with your kids’ anxiety? Any techniques you can share? Lots and lots of talking about it. I always tell them, “It’s just your anxiety. It will pass.” (I am trying to get the point across that the anxiety doesn’t define them. It is not who they are, but it is something they have to deal with). I do force them to do activities they don’t want to when they are having anxiety because once they do them, they realize they are successful and it makes it easier the next time. I have taught them to take slow deep breaths when they get really anxious. Amanda, I really enjoyed your post. Thanks for sharing your story. It is very inspirational.